September 24-25, 2015 MASBIRT TTA trainer, Enid Watson, MASBIRT TTA Program Coordinator/Trainer Britt Carney, and MDPH- Bureau of Substance Abuse SBIRT Coordinator, Carol Girard attended the International Network on Brief Interventions for Alcohol and Other Drugs (INEBRIA) Conference. The conference focused on multi-disclipinary based training, education and research initatives in SBIRT. The MASBIRT TTA team also discussed adolescent SBIRT initatives in Massachusetts as part of a poster session. August 4, 2015 David Roll, MD, SBIRT Champion in the Cambridge Health Alliance (CHA) system, discussed incorporating SBIRT into routine primary care. July 22, 2015 Lee Ellenberg, Training Manger, appeared on WBUR's Radio Boston discussing SBIRT training efforts in local schools. To read the story, click here: Could Screening Students for Drug Use Curb the Opioid Addiction Crisis? 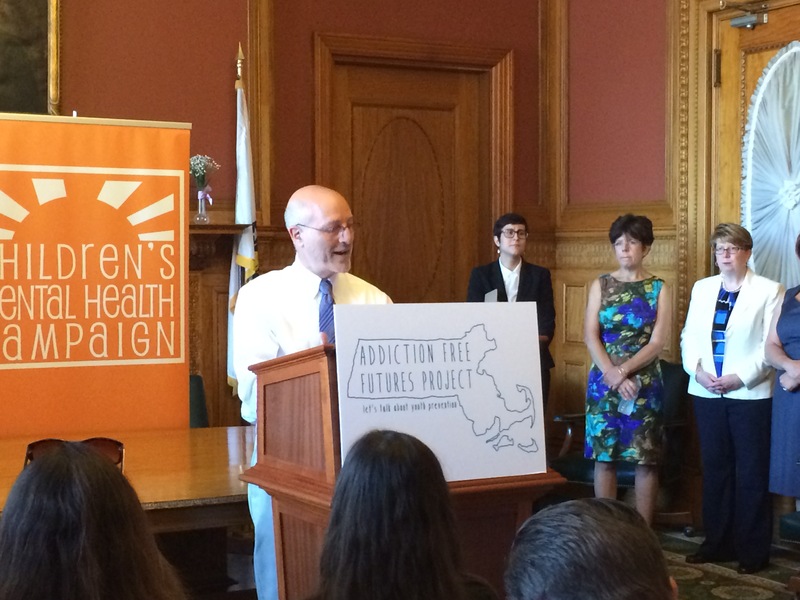 July 16, 2015 Lee Ellenberg took part in the 'Addiction Free Futures' launch and the legislative hearing for H. 1796/S. 284- An Act Relative to Preventing Adolescent Substance Abuse by Expanding SBIRT. November 22, 2013 MASBIRT TTA hosted the well received statewide SBIRT conference entitled, 'Addressing Unhealthy Substance Use in Primary Care.' Over 100 people attended the conference including clinicians, administrators, and service providers. The conferernce provided an opportunity for participants to place SBIRT within the context of the evolving healthcare environment, particularly as part of the advancing behavioral health integration initiatives. Participants also had an opportunity to practice motivational interviewing skills. Materials and resources from the conference can be found here. July 24, 2013 MASBIRT TTA trainer, Enid Watson and MDPH- Bureau of Substance Abuse SBIRT Coordinator, Carol Girard attended the Massachusetts Section of the American Congress of Obstetricians and Gynecologists 2013 Annual Meeting and Education Program to share information and resources about the impact of substance use on pregnancy and on women of childbearing age. For more information, visit the Special Considerations for Women page. April 3, 2013 This was a busy day for MASBIRT TTA. Staff attended two different events. Lee Ellenberg, LICSW and Christine Pace, MD, MSc presented at the MA Health Council conference The Integration of Behavioral Health and Medical Health held at Westin Copley Place, Boston, MA. Mr. Ellenberg and Dr. Pace's presentation entitled, 'SBIRT: Addressing unhealthy substance use in primary care' addressed how substance use fits into the larger behvaioral health integration efforts, presented a model of SBIRT integration from the Boston Medical Center primary care practice, and discussed lessons learned. The presentation was well received and generated much discussion. MASBIRT TTA also sponsored a table at the MA IntNSA 2nd Annual Addiction Nurse Conference at the Best Western Conference Center, Holyoke, MA. MASBIRT TTA's Medical Director, Daniel Alford, MD, MPH, was the keynote speaker and presented 'Is It Pain Or Addiction?' Over 300 nurses from all parts of the state attended the conference to obtain information about addictions and many expressed interest in SBIRT services.